Olfactory representation in the honey bee antennal lobe: Investigations on a filter's functions and dysfunctions. 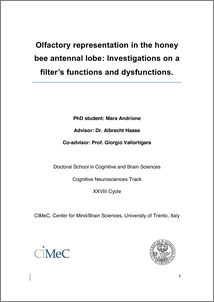 Andrione, Mara (2016) Olfactory representation in the honey bee antennal lobe: Investigations on a filter's functions and dysfunctions. PhD thesis, University of Trento. Restricted to Repository staff only until 9999. The honeybee, Apis mellifera, is an established model for the study of olfactory processing, olfactory learning and memory, and the related plasticity. The primary centre for olfactory processing in the bee brain, the antennal lobe, has a very important function in odour coding and odour discrimination. Nevertheless, both its structure and its function are plastic. In this thesis, I analysed the structural antennal lobe plasticity related to associative learning, and that related to a non-associative experience, i.e. prolonged odour exposure, in the adult honeybee. Subsequently, I analysed the functional modification taking place in the latter case within the output units of the antennal lobe, showing that parallel structural and functional changes occur. In the last part of the thesis, I focused on the effects of a common neonicotinoid pesticide, imidacloprid, on antennal lobe function and the discrimination abilities of honeybees. I demonstrated that both are strongly impaired in the acute treatment of the brain with such substance.